The health and function of montane riparian and aquatic ecosystems should be monitored using quantitative, process-based, repeatable metrics in order for resource managers to consistently and affordably maintain, restore and conserve these dynamic environments. To increase our understanding and better assess the condition of riparian and aquatic ecosystems, we must link metrics of hydrologic alteration with quantitative assessments of physical habitat (geomorphology and water quality) and biotic communities. The need for water managers to understand these fundamental relationships is particularly acute with climate warming, where temperatures are expected to increase 2 - 6 degrees Celsius. 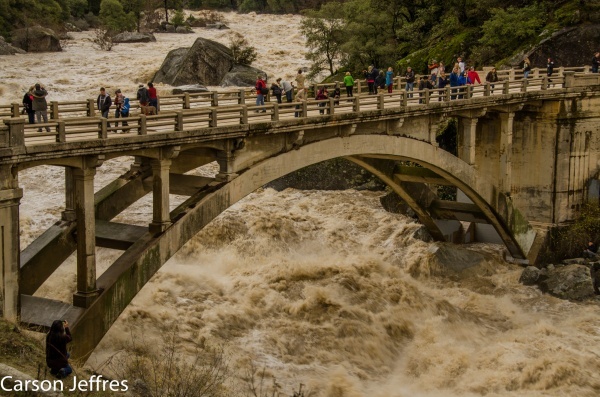 Anticipated changes to hydroclimate are well documented, and include earlier snowmelt and runoff timing, precipitation shifting from snowfall to rainfall, both prolonged drought and flashier floods, and increased stream temperatures. Here we build upon six established study sites in the Yuba, American and Tuolumne watersheds to create a long-term monitoring framework that quantifies and evaluates basic stream hydrological conditions and hydrological alteration in an effort to better understand how increasingly scarce water resources affect aquatic ecosystems, and how they can be managed to balance complex ecological and anthropogenic needs. These long-term study sites are located in streams with varying flow regime types: unimpaired, semi-impaired (regulated-bypass reaches), and fully impaired (regulated-peaking or regulated-augmented reaches). At each study site, we conduct seasonal surveys to assess current species assemblage and abundance and correlate this information with data on the physical stream conditions including channel morphology, thermal regime, hydrologic variability and habitat availability. This data also supports monitoring for ongoing modeling studies in the Sierras, including stream temperature modeling at the mesoscale, the effects of hydropower operations on aquatic and riparian ecosystems, and integrating existing understanding of the snowmelt recession limb on stream temperatures and biota. To learn more visit River Thermohydrographs. This web application uses data collected by the Center for Watershed Sciences at UC Davis as part of long-term Sierra Nevada River monitoring project, building on a previous California Energy Comission Project. Solinst pressure transducers have been deployed (since 2011) in 5 rivers and are logging water temperature and stage at 15 min intervals. Collection of observed data through monitoring is a vital tool for assessing change in aquatic ecosystems, particularly in relation to climate warming and river regulation. This app illustrates a few useful ways to summarize and plot these data. Thermohydrographs are a way to show both stage (level) and water temperature on a single plot. In addition, check out Time Lapse Hydrography which show time lapse videos about monitoring the Sierra Nevada river's edge habitat with remote game cameras.